RMS Titanic, showing 8 lifeboats along the starboard-side boat deck (upper deck):4 lifeboats near the bridge wheel house and 4 lifeboats near the 4th funnel. The Titanic passing Carrickfergus in 1912, as depicted by artist Debra Wenlock. Harland and Wolff put their leading designers to work designing the Olympic-class vessels. The design was overseen by Lord Pirrie, a director of both Harland and Wolff and the White Star Line; naval architect Thomas Andrews, the managing director of Harland and Wolff's design department; Edward Wilding, Andrews' deputy and responsible for calculating the ship's design, stability and trim; and Alexander Carlisle, the shipyard's chief draughtsman and general manager. Carlisle's responsibilities included the decorations, equipment and all general arrangements, including the implementation of an efficient lifeboat davit design. Shortly before midnight on Sunday 14 April 1912 the largest liner in the world struck an iceberg in the North Atlantic at latitude 41.46 degrees north, longitude 50.14 degrees west. Less than three hours later the R.M.S. Titanic sank and over 1500 men, women and children died. This was the worst maritime disaster in peacetime. The world was very different in 1912. The British Empire was at its height America- was emerging.as a world power, radio and television did not exist, the motorcar was a rare and luxurious item, the horrors of the World Wars unimagined. The only way to cross the ocean was by sea and the tremendous increase in immigration to the United States, (over 1,200,000 people in 1907), meant an increased demand for steamships. The transatlantic passenger liners at this time were floating hotels. The rich travelled on the upper decks of ships. They had luxurious staterooms and beautifully decorated public rooms, where they could amuse themselves on the voyage, which could last from five to fourteen days. The poor travelled in third class in the bottom and back of the boat, where the noise and motion of the boat were most noticeable. This part of the ship was called steerage, and the quarters were often cramped. ships as big or as fast. So they built two new flagships. On 31 May 1911, the Olympic began her maiden voyage from England to America and on the same day the Titanic was launched at Harland and Wolff shipyard in Belfast. Many famous transatlantic passenger liners had been built by Harland and Wolff for example: 1870 The Oceanic: 1874 The Britannic and The Germanic: 1889 The Teutonic and The Majestic: 1899 The Oceanic 11; 1910 The Olympic. The Titanic was the latest and most luxurious in the White Star Line's fleet. Known as the R.M.S. Titanic, she was a Royal Mail Ship and carried 3,500 bags of mail in addition to 900 tonnes of baggage. The Titanic had four great smokestacks or funnels. Three of the funnels were used for carrying off smoke and steam, but the fourth was a dummy and was used as a ventilator. Each funnel averaged 19 metres (62 feet) high and was 6.7 metres (22 feet) across. The ship had three anchors in the bow, one on each side, and one on top of the bow at the front. Together these three anchors weighed 31 tonnes. The rudder at the back that steered the ship weighed just over 100 tonnes. The Titanic was thought to be unsinkable because the hull had a double bottom. This meant that the hull was constructed with two layers of steel, one inside the other. She also had sixteen compartments with electronically operated double-cylinder watertight doors. Even if, by some extraordinary circumstance, as many as two of these compartments were to fill with water, the ship should still remain afloat. The number of lifeboats carried was more than required under Board of Trade rules but insufficient to hold all the passengers, never mind the crew! There was a short fall of 1028 places. The ship was divided into three classes: first, second, and third. Most of the space on the ship, especially in the middle of the ship and on the upper decks, was given over to first-class. First Class passengers paid £2,800 ($4,350) or about £30,000 ($50,000) in today's money, to stay in one of the Titanic's elegant suites. The price included meals in the dining rooms. The public rooms were spacious and elegant. There was a great lounge and a smoking room, usually reserved for male travellers. The Titanic's four elevators had richly carved panelling; there was a Turkish bath, a swimming pool; and a full size squash court. Pets were kept in kennels where their owners could visit them. A separate lounge was provided for the maids and valets of wealthy passengers. Second Class was the smallest and had simple but tasteful public rooms on upper decks, towards the rear of the ship. The one way fare for second class passengers was £40 ($65) and upwards. Third Class passengers were given space furthest down in the ship and they paid an average of £22 ($35) for their journey cross the Atlantic. On this crossing, as on most voyages to the United States, many of the immigrants had come from all parts of Europe and spoke little or no English.. It was strictly forbidden to go from second or third classes into first and gates were set up to stop the classes from mingling. The enormous dining room on D deck was as wide as the ship and could seat over 500 people at one time. The kitchens were among the best equipped and most modern anywhere. On 2 April 1912 the Titanic left Belfast to cross the Irish Sea to her home port of Southampton. On 10 April 1912 the ship, under the command of Captain Edward J. Smith, began her maiden voyage. The liner first stopped at Cherbourg, France, to board more passengers and then sailed on to Queenstown (Cobh), Ireland. By 1.30 p.m. on Thursday 11 April the Titanic had loaded her final passengers and was under way for New York by the recognised northerly route. There were 1,308 passengers and 898 crew members on board, a total of 2,206 people. The weather was fine, the seas calm, the food and company excellent and the ship was performing well Sailing at 21 knots, a very fast speed, the Titanic was expected to dock in New York on Wednesday 17 April. At 11.40 p.m. on Sunday 14 April the Titanic struck a huge iceberg a glancing blow. A few people noticed a slight jar, nothing more. However a 90 metre (300 foot) long gash had been ripped along the lower part of the hull damaging five compartments. As soon as the collision occurred Captain E.J. Smith ordered the ship to stop. This took almost four minutes and the ship travelled a further half a mile (0.8km.). Although alarms were sounded immediately and the electronically operated double-cylinder watertight doors shut, they could not prevent water spilling into other compartments. Within ten minutes the first three holds were flooded to depths of about 4 metre (14 feet). The ship began, slowly at first, to sink from the bow. As one compartment began to overflow, the one next to it would then begin to fill up. This pattern was repeated from bow to stern. "Have struck an iceberg. We are badly damaged. Lat. 41.46 N . , long. 50.14 W."
At 12.30 a.m. the message was repeated and the new SOS (save our ship) signal added. The nearest ship, the Cunard Carpathia, changed course but her captain, Arthur Rostron, estimated it would be five hours before they would reach the Titanic. Captain Smith ordered all passengers to gather on the boat deck. However there were several problems. • The lifeboats, fully loaded, could hold 1,178 people and there were 2,206 on board. • There had been no lifeboat drill and so people did not know which boat they had been assigned to or how to get into these boats. • The crew were inexperienced and poorly organised so that they had difficulty launching the lifeboats and some boats were not filled to capacity. Between 12.45 p.m. and 1.45 a.m. eight white distress rockets were fired. There is still some dispute as to whether or not a British ship named The California was near enough to have seen the rockets and answered the distress calls. However The California's captain had already gone to bed and the wireless had been shut down for the night. The lifeboats tried to get as far away from the ship as possible because they feared that they would be sucked down as the ship sank. This may be one reason why so few survivors were rescued from the sea. With sea temperatures around -2°C (28°F), few could have survived very long. 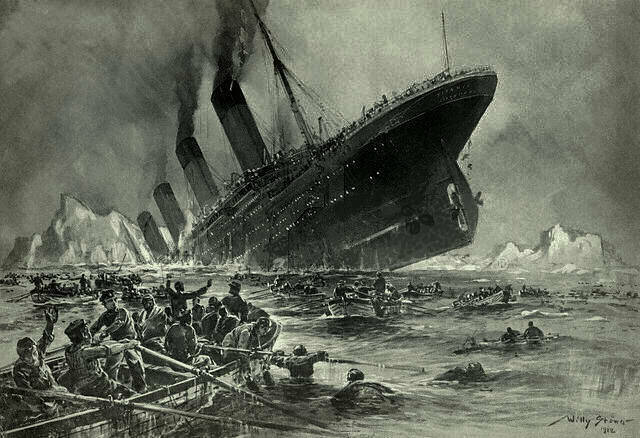 At 2.20 a.m. on 15 April the Titanic sank, only 703 people were saved. 1503 men, women and children were drowned. The Carpathia arrived at 4.00.am., and began to search the area for survivors. She took on board those in the lifeboats and then the survivors realised the full extent of the disaster. Two Official Inquiries were held, the American Inquiry was authorised by the U.S. Senate on 17 April, the British Inquiry began on 3 May. Many stories have been told about the Titanic's last hours and many survivors sold their stories to newspapers and magazines. Often these stories were inaccurate and exaggerated, for example, there was never any proof that steerage passengers were forcibly held back in their quarters. What is not in dispute is that while all children travelling first or second class were saved only 23 out of 76 third class children survived. The Inquiries made several recommendations with regard to the number of lifeboats each ship should carry and the training given to crews and these were quickly implemented. For a few years there was great interest in the disaster but, with the advent of World War 1, attention turned away and for almost forty years very little was heard about the Titanic. formed in America in the 1970's and the Ulster Titanic Society has its inaugural meeting in the Linenhall Library in May 1992. Over the years great interest has been shown in various schemes to find and raise the Titanic. The problem was that although the original co-ordinates had been given as 41 degrees 46 minutes North and 50 degrees 14 minutes West, even a slight deviation from these bearings could mean a variation of several square miles and also the ship could have drifted as it sank. It was not until 1 September 1985 that the Titanic was found by a team of scientists led by Dr Robert Ballard. This team was made up of American scientists from the Woods Hole Oceanographic Laboratory and a group of French oceanographers from the Research Institute for the Exploration of the Sea (IFREMER). Photographs of the wreck caused great excitement and Ballard made plans for further exploration of the site. In July 1986 Ballard and his team returned to photograph the Titanic even more closely. This time they use a manned submersible (the Alvin) which was able to get close to the wreck and a camera-equipped, remote control robot (Jason Junior or 33) which was able to get right inside the liner. Using special equipment they photographed and filmed every detail of the ship. Millions of people were amazed at what they saw and many questions were answered. The most significant finding was that there is no sign of the 90 metre (300 foot) long gash that has always been accepted as the reason why the Titanic sank. Instead evidence was found of buckled and torn plates and sheared rivets on the ship's hull. This damage must have occurred when the Titanic struck the iceberg. The discovery of the Titanic sparked a debate about what should happen to the ship. In October 1985 Robert Ballard appeared before the United States Congress to request that the Titanic be made an International Memorial. Many people feel that the ship ought to be left as it was found, as a memorial to those who lost their lives in 1912. They feel that we can learn enough from the photographs to answer our questions. However a company called "Titanic Inc." has obtained salvage rites to the wreck and has brought many artefacts from the sea bed and this has caused great concern and anger the families of those who died. The Titanic Memorial Garden in Belfast was completed in TIME for the 100th anniversary of the sinking of the great ship. The centrepiece of the gardens is a magnificent memorial bronze mounted on to a 12 meter granite plinth that weighs 25 tons. Photocast not only finished the bronze tablets but also installed them, to extremely tight tolerances, on site in Belfast. The finished monument will be known as 'The Belfast List'. The Memorial Garden was opened to the Belfast public and the world's press at 9.00am on Sunday the 15th April; many of the descendants of the lost attended a very emotional service. Before the advent of air travel, the only way to cross the Atlantic was by boat and there were luxury liners sailing regularly between Europe and the United States.. 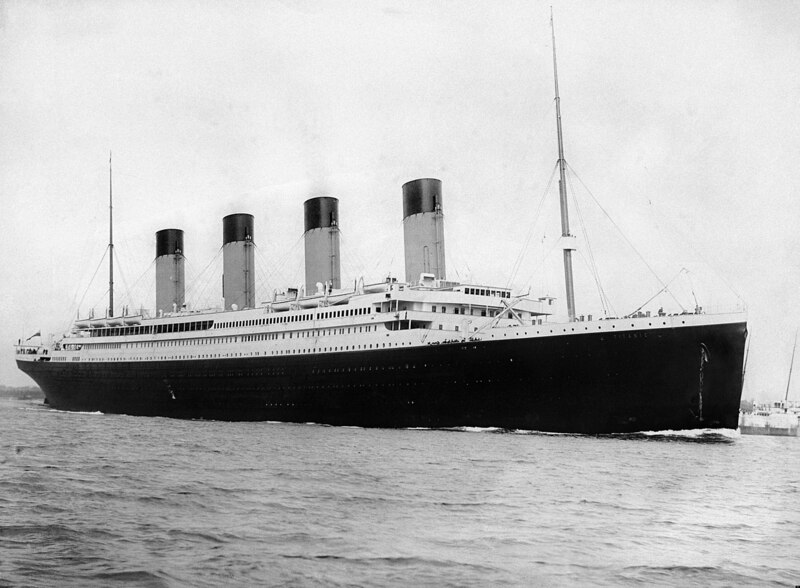 The Titanic is one of the most famous ships ever to have been built.